Daniel Barenboim conducted an updated Cosi Fan Tutte a few years ago. A scene from that production is shown above. 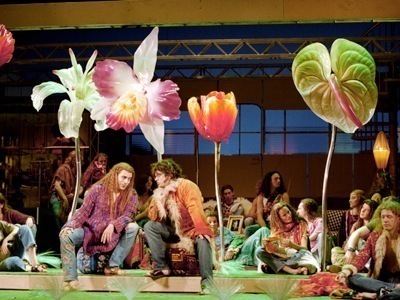 As you can tell the opera has been set during the mid to late sixties, the flower power era. It was also, at least in the minds of some of us, the era of free love. The plot centers around two lovers who assert that there are girls are faithful and would never betray them with other men. Don Alfonso, a somewhat older and wiser friend, assures them that all women are fickle and corruptible. They agree to disguise themselves and try to seduce the other one’s girl. The resolution shows each lover returning to his or her original SO, In the staged production there is a note of wistful regret as each lover realizes that he could have found true love with the other girl. It ends on a bittersweet note. Whether that was Mozart’s or da Ponte’s intention is open to discussion. There are some laugh out loud moments in the second act, and if you have fond memories of your mis-spent youth in the sixties, or even if those memories have been destroyed, you might enjoy this production.